Saying goodbye to something that you love can be painful. Honestly, I try to avoid it as much as possible. Because I love all that lives and grows here on the farm, my favorite flowers are no exception to the, "do not say goodbye category." Enter in...seed saving. Yes, I find great joy in saving seeds from my favorite flowers, vegetables, and fruits on the farm. It takes some time and effort, but like I said... I don't like saying goodbye. Exhibit A: This beautiful pumpkin grew on the farm this last season. Thanks to our sweet honey bees, it was a cross pollination success. It appears that a honey bee visited the flower of a Jarrahdale pumpkin and then came over to see a carving pumpkin flower. The results- this gorgeous specimen. I saved some seeds from it of course, hoping next year's pollination will deliver a close repeat offender. I know that I can't bank on it because of pollination variables, but I will be hopeful. We all know that pumpkins come in all shapes and sizes. The inside, the outside, the seeds, the smell, all can vary pumpkin to pumpkin. Some smell like freshly peeled cucumber when you open them. Others smell like things I'd rather not mention. The color range is so vast with pumpkins, and the purpose is so varied as well. We grow pumpkins for their colors and pretty autumn decor. We also grow pumpkins for Halloween carving and seed roasting. The most useful pumpkins we grow however, are the pie pumpkins. Having fresh pumpkin on hand for recipes is quite useful year round. Some pumpkin varieties have very "stringy" insides and limited seeds. To save the seeds from a pumpkin is a pretty straight forward task. Cut the pumpkin open and remove all of the seeds you hope to keep. Seven seed varieties for next year's planting. Seeds drying for several days on the counter. Once the seeds have been cleaned and sorted, they need to sit out and dry for several days. The moisture must be out of the seeds before they are stored over the winter. It is important to remove any underdeveloped seeds (top), broken seeds (right), and to keep only the fully developed seeds. After the seeds are dried, we store them in the refrigerator until spring. This process is called "stratification," and it mimics nature's winter. 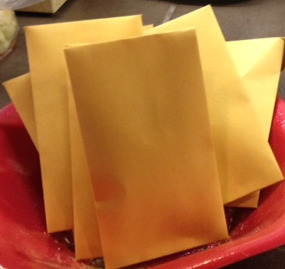 Seeds will be packaged in envelopes and labeled according to contents. Seeds will be available in the spring of 2016. Luna, Patch and Mary eager for pumpkin treats. Seed saving wouldn't be complete around here if the rest of the family didn't get in on it. Left over pumpkin found its way into the pasture for the cows, the goat pen, and the chicken coop. Pumpkin for everyone! Calendula seeds for next year headed to the refrigerator. The bees love these in the fall. Sunflowers- a honey bee favorite. Colorful reminders like these pictures get us through these cold winter days. Knowing we will see these beautiful flowers again next season makes the effort to save the seeds worth it! Klann farm will have seeds come spring 2016. If you are interested in planting similar flowers like the ones found at Prineville Honey Bee Haven, be sure to check back with us.